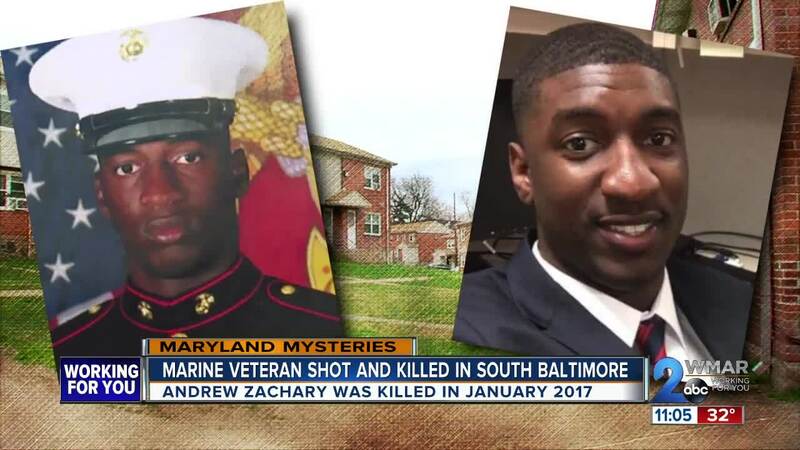 Andrew Zachary, a marine veteran, was shot and killed while visiting a friend in south Baltimore's Brooklyn neighborhood. Andrew Zachary was a boy who, with some tough love from his mom, became a man in Baltimore -- until he was gunned down in south Baltimore's Brooklyn neighborhood in January 2017. Veobia Akilo thought she was doing everything right. She moved her children up and down the east coast before settling Baltimore, exposed them to different cultures, and provided them with a stern but loving structure that only a single mom could. She was especially that way with her oldest son, Andrew. "Just with Andrew, I always tell folks I was that mother. I would call him, check on him, go to school. Who goes to high school to check on their kid," Akilo asked rhetorically reflecting on the lengths she would go to check on her son. "Meet the principal, call him everyday." Akilo admits Andrew needed a little more structure. So after he graduated from high school, he went into the Marines to, as she puts it, get his act together --- and it worked. "He was just a man. He came back a man. He came to Baltimore. He had changed," Akilo remembered in the days and months following Andrew's time in Parris Island and with the Marines. Gone were the days where she'd have to drag Andrew to church or of him misbehaving -- now he was young man, a husband, and a father. And after a tour overseas protecting his country, he was settling back into Baltimore, on his way to visit a friend near the Brooklyn Homes public housing. "Then Monday, the city -- the offices were closed because of Martin Luther King Day and so I remember getting a call that Andrew has been shot," Akilo said. Baltimore Police say Andrew had bumped into someone. "Our investigators believe that he was involved in some sort of dispute on the block. And during the dispute, the gunman shot him before leaving the location," Det. Jeremy Silbert, a spokesman with the police department, said. It was an argument over what police say they're unsure. But whoever pulled the trigger managed to get away quickly leaving investigators stumped as to who could or would shoot the young veteran. When Veobia made it to the hospital, she wondered the same. "And so I finally got up there and I said, you know, I'm Andrew's mom, where is he? They said well the doctors will be with you. I said, 'well he must be alright since you're not letting me see him.' I remember saying that. So we're in this little room and we're waiting and then they come out and they tell me, 'I"m sorry, he didn't make it," Akilo said. Taken away a bullet over what Akilo calls something small. "Really we're unsure whether or not he knew he killer or if this was someone he got into a dispute with the day of. But Andrew Zachary was 23 years old. He was in the military and we're hoping someone would come forward," Silbert said. It's an unsettling feeling for Akilo's entire family. "As a single parent, you work so hard so that your child does not become a statistic and that's what I did," Akilo said. A mother who did everything right, leaving a void in her heart from something so wrong. "His sibling, his wife -- a widow. Can you imagine being a widow at 23," Akilo asked. "His daughter will never know him and he loved her so much. Just think about my entire family, his friends. So yeah, it's been a huge loss for everyone who loved him."